Carlisle United Football Club (/kɑːrˈlaɪl, ˈkɑːrlaɪl/) is a professional association football club based in Carlisle, Cumbria, England. The team compete in League Two, the fourth tier of the English football league system. They have played their home games at Brunton Park since 1909. The club's traditional kit is blue with white and red detail, whilst the badge takes elements from the city's coat of arms by including two wyverns. They are nicknamed the "Blues" due to their kit, as well as the "Cumbrians" due to their status as the county's only Football League side following local rivals Barrow and Workington dropping out of the league in the 1970s. Formed in 1904, the club entered the Lancashire Combination the following year and were crowned Division Two champions in 1906–07. They entered the North Eastern League in 1910 and went on to win the league title in 1921–22, before being elected into the Football League in 1928. They spent the next 30 years in the Third Division North, at which point they were assigned a place in the newly formed Fourth Division, from where they won promotion in 1961–62. Relegated the following season, they then won two consecutive promotions, finishing the 1964–65 season as champions of the Third Division under the stewardship of Alan Ashman. They secured promotion out of the Second Division in 1973–74, but stayed only one season in the First Division and were relegated back to the Third Division at the end of the 1976–77 campaign. Promoted again under Bob Stokoe in 1981–82, they suffered successive relegations to return to the fourth tier by 1987. Carlisle won promotion as champions of the fourth tier in 1994–95, but were relegated the next season, before winning promotion again in 1996–97, only to be relegated again the following year. Their 76-year stay in the Football League came to an end with relegation in 2003–04, though player-manager Paul Simpson secured an immediate return after leading United to victory the 2005 Conference National play-off Final. They then won the League Two title in 2005–06, and remained in League One until their relegation at the end of the 2013–14 season. The club has reached the final of the Football League Trophy six times, more than any other team, winning it in 1997 and 2011, and finishing as runners-up in 1995, 2003, 2006 and 2010. Playing in the First Division for the 1974–75 season, Carlisle won their first three fixtures to go top of the English football pyramid, partly due to the likes of Chris Balderstone, scoring the penalty which put them at the top, and Bobby Parker who both went on to make at least 375 league appearances for Carlisle. The success was short lived however, they finished the season in bottom place and were relegated. Highlight victories include doing a double over Everton, and home victories over eventual champions Derby County, and former title holders Ipswich Town, Arsenal, Burnley, Tottenham Hotspur and Wolverhampton Wanderers. The following season began in disappointing manner. Following a number of heavy defeats the club found themselves drafted into a relegation battle, occupying the final relegation spot for a period of the season. However, a resurgence of form in the New Year following the return of target man Lee Miller, and fellow front-man Rory Loy saw Carlisle string together a number of good results to claw themselves clear of the relegation zone, eventually finishing the season in 17th position. The club retained Greg Abbott as manager, offering a 1-year extension to his current deal, whilst also extending assistant Graham Kavanagh's contract for another season. On 3 May 2014 Carlisle were relegated, ending an 8-year spell in the third tier having finished 22nd following a disastrous run of results under Kavanagh, meaning the club would compete in League Two for the 2014/15 league season. Kavanagh removed assistant manager Davie Irons from his post as assistant manager early in pre-season as work to overhaul the playing, and backroom staff was underway in Kavanagh's project to turn Carlisle into a top footballing side. Graham Kavanagh was sacked on 1 September 2014, following a winless start to the season, a 5–0 away defeat to newly promoted Cambridge United proved to be the final straw; alongside a record run of 15 league matches without a win for the club, ultimately culminating in Kavanagh being removed from his role as manager. He left the club having one of the worst records of any manager in the clubs history, with a win ratio of only 25% and a relegation under his name. On 19 September 2014 Keith Curle was appointed as Carlisle United manager, along with his former assistant Colin West. They signed a deal until the end of the 2015–16 season. Curle got off to a flying start, winning his first full-match as manager 1–0 against fellow strugglers Tranmere Rovers, This was followed by a 3–0 victory over Hartlepool United, and another home 3–0 victory against Stevenage. The run of form lifted Carlisle from the foot of the table, and out of the relegation zone. The surge in form soon petered out however, and United again found themselves near the trapdoor of the Football League's basement division. 7 points from 3 games towards the back end of the season meant that Carlisle secured their Football League safety with 2 games to spare, following a 2–0 home victory over promotion-chasing Plymouth, just 4 days after a courageous 1–1 draw away at Champions Burton Albion. The next season was a much better one but not enough for a promotion push, with the team finishing 10th. A highlight of the season was a visit at Anfield for the third round of the League Cup and a famous 1–1 draw against giants Liverpool, who prevailed 3–2 on penalties. The first half of the 2016-17 season was excellent for the club, with just one loss (against then-bottom Newport County). The play-offs seemed almost guaranteed. However a disastrous sequence followed, with only 4 wins in the next 21 games including 10 losses resulting in a drop from 2nd to 10th with only two games remaining. But a comeback home win against Newport County combined with favourable results elsewhere were enough to put them back into the play-off positions. Then, another comeback at play-off bound Exeter in the last game proved enough for a final position of 6th, and a play-off semifinal showdown with the same opponent. However, Exeter beat them 6–5 on aggregate to condemn Carlisle to another season in League 2. In 2011, a plan was introduced to move to a 12,000 capacity all-seater stadium to be built in the Kingmoor Park area of the city which was to be locally known as project Blue Yonder. Though considerably smaller than Brunton Park, the new ground could be upgraded to a larger capacity if demand was met. An extension of this 12,000 capacity is thought to rely on the club achieving promotion to the Sky Bet Championship. The proposals have received mixed responses from Carlisle fans. There has since been no news as to whether the project has any advancement. In December and January of the 2015–16 season, Carlisle played their home games at Deepdale in Preston, Bloomfield Road in Blackpool and Ewood Park in Blackburn, as Brunton Park recovered from flooding caused by Storm Desmond. Carlisle's traditional local rivals are Workington and Barrow, however the two clubs have not featured in the Football League since the 1970s and consequently competitive matches between the teams are extremely rare. Prior to 2008 the club's nearest professional football club was Gretna F.C., who at one time played in European football thanks to the financial input of Brooks Mileson (a United supporter also, who once tried to buy United). The club were residents of the Scottish Football League however and therefore the chance of meeting in competitive competition remained highly unlikely. That club was eventually liquidated in 2008. To date Carlisle United have played 82 seasons in the Football League, their relegation in 2004 and reinstatement the following year remains the only departure from the Football League since the club was first admitted in 1928 (excluding wartime). United are currently the only club to have reached the final of the Football League Trophy on six occasions. This, alongside their two wins, makes them the most successful club in the competition's history. The club's highest achievement outside of cup competitions came in 1974 when the club was promoted to the first tier of English football and spent a short period of time at the top of the division. Carlisle still remains the smallest location in England, by local population, to have had a resident top-flight football team since 1906. Carlisle competed in almost every season of the Football League Trophy, including in 2004–05 when they did not hold Football League status. In total they have reached the final six times, more than any other team. The club first won the competition in 1997, beating Colchester United. The game, which took place at Wembley Stadium, was drawn 0–0 in 90 minutes and continued to a penalty shoot-out. Thanks to Tony Caig's heroics in goal Carlisle won the shoot-out 4–3. The second win came in 2011, a year after suffering a 4–1 defeat to Southampton in the previous final. This time Carlisle were able to defeat Brentford by a single goal. The goal was scored by Peter Murphy, Carlisle's longest serving player at the time, whose foul gave away a penalty in the previous final defeat a year earlier and whose wife had given birth two days earlier. As of 7 May 2018. ^ "The Carlisle United Story". Carlisle United FC. 21 June 2010. Archived from the original on 27 September 2008. Retrieved 29 April 2011. ^ "Carlisle United Reserves". Football Club History Database. Retrieved 29 April 2011. ^ "History: Carlisle United F.C." The News & Star. 16 July 2008. Archived from the original on 26 April 2010. Retrieved 26 April 2011. ^ a b c "The Unforgettable Football Manager". Perspective UK. 1 March 2007. Retrieved 26 April 2011. ^ "Beginning a football revolution". BBC Liverpool Online. 30 November 2009. Retrieved 26 April 2011. ^ Ricky George (14 September 2004). "Carlisle on a recovery mission". The Telegraph. Retrieved 26 April 2011. ^ a b Roger Lytollis (1 September 2004). One Hit Wonder: The Jimmy Glass Story. The History Press. ^ "Abbot appointed as Carlisle manager". BBC Sport. 5 December 2008. Retrieved 29 April 2011. ^ "Carlisle United: Graham Kavanagh wants to be manager". BBC Sport. Retrieved 17 September 2013. ^ "Carlisle United: Graham Kavanagh named as Greg Abbott successor". BBC Sport. Retrieved 30 September 2013. ^ "Carlisle were relegated as League One champions Wolves set a new all-time third-tier points record of 103". BBC Sport. Retrieved 3 May 2014. ^ "John Sheridan: Carlisle United appoint new manager". BBC Sport. 2018-06-05. Retrieved 2018-07-19. ^ a b c d e "Carlisle United: Crests, Colours and Nicknames". The Beautiful History. Retrieved 26 April 2011. ^ a b c "Carlisle United Kits". Historic Football Kits. Retrieved 26 April 2011. ^ "Black armbands on Sunday". Carlisle United FC. 31 March 2011. Archived from the original on 1 April 2011. Retrieved 25 August 2013. ^ Cartwright, Phil (20 December 2015). "Football League: Five things you may have missed". BBC Sport. Retrieved 20 December 2015. ^ "Company Details". Carlisle united FC. 26 June 2007. Archived from the original on 29 July 2012. Retrieved 25 August 2013. ^ Amanda Little (19 July 2004). "Jenkins offers his experience to Fred Story". News and Star. Archived from the original on 13 August 2014. Retrieved 26 April 2011. ^ Chris Story (7 November 2009). "Jenkins becomes majority shareholder". News and Star. Archived from the original on 13 August 2014. Retrieved 26 April 2011. ^ John Colman (30 October 2009). "Carlisle Utd is 'old boys' club that is letting down the fans' – David Allen". News and Star. Archived from the original on 6 April 2012. Retrieved 26 April 2011. ^ Nigel Bunyan (19 November 1996). "Soccer chief who saw UFO is under the moon". UFOs over America. Retrieved 22 May 2006. ^ Harris, Nick (4 September 2006). "Brooks Mileson: 'This club is in my soul. I would have ended up croaking if I had not come to Gretna'". The Independent. Retrieved 27 April 2010. ^ Amanda Little (8 July 2008). "Liquidation signals the final nail in Gretna coffin". The Cumberland News. Archived from the original on 14 March 2009. ^ "Club Rivalries Uncovered" (PDF). Football Fans Census. Archived from the original (PDF) on 20 October 2013. Retrieved 27 April 2011. 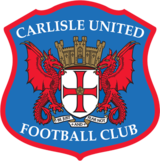 ^ "Carlisle United FC Player Profiles". Carlisle United F.C. Retrieved 2 June 2016. ^ "Meet the Coaching Staff". Carlisle united FC. 12 April 2011. Archived from the original on 29 September 2013. Retrieved 19 September 2013. ^ * "United Kingdom Census". Retrieved 29 April 2011. ^ Sachin Nakrani (3 April 2011). "Carlisle's defeat of Brentford born of Peter Murphy's desire to atone". Guardian.co.uk. Retrieved 29 April 2011. ^ Stuart Raynor (4 April 2011). "Peter Murphy takes glory on Mother's Day". Journal Live. Retrieved 29 April 2011. ^ "Carlisle United Club Records". Carlisle united FC. 16 September 2009. Archived from the original on 2 November 2011. Retrieved 25 August 2013.